“When famed physicist Stephen Hawking passed away earlier this year, he left a scientific legacy that included one of the knottiest paradoxes in modern theoretical physics. Now his final paper has just been published, revisiting the question of whether information can be retrieved from a black hole or whether it is lost forever. The paper posits that information can be stored in a halo of “soft hair” surrounding a black hole. 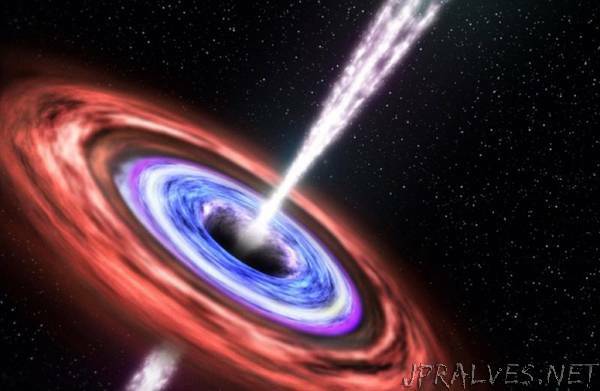 Once upon a time, physicists believed that black holes had no hair. “We can often tell people apart by looking at their hair, but black holes seemed to be completely bald,” co-author Malcolm Perry of the University of Cambridge writes in The Guardian. That is, all you needed to describe black holes mathematically was their mass and their spin. So there would be no noticeable change if you threw something into a black hole—nothing that would provide a clue as to what that object might have been. That information is lost. In quantum mechanics, empty space is not really empty. Matter/anti-matter pairs of so-called “virtual” particles are constantly popping into existence and annihilating just as quickly. But if a pair pops up near the event horizon of a black hole and one of the pair falls in, the black hole will emit a tiny bit of energy, decreasing its mass by a corresponding amount. Over time, the black hole will evaporate. The smaller the black hole, the more quickly it disappears. But a 2012 paper revisiting the paradox threw yet another spanner into the works. While pondering possible mechanisms for getting information out of a black hole, the late Joseph Polchinski (University of Santa Barbara) and three colleagues realized that three much-believed fundamental postures of physics could not all be true. One had to be wrong, and they believed it was the nature of the event horizon. Conventional wisdom held that when someone crossed the event horizon, they would notice nothing amiss. It was only as they moved closer to the singularity that the extreme gravitational forces would rip them to shreds (Thorne called this being “spaghettified”). Physicists call this the “No Drama” scenario. But Polchinski et al. said that in-falling observers would be burnt to a crisp by a literal wall of fire at the horizon. It’s similar to a proposal by The Ohio State University string theorist Samir Mathur a few years before. Mathur argued that black holes are not empty pits but packed full of strings (the fundamental units of string theory), with an actual surface like a star or planet. Polchinski’s firewall is essentially a hot fuzzball. But this is just the most straightforward solution to resolve the paradox. Physicists loathe to sacrifice No Drama have proposed all kinds of alternative solutions in the ensuing years. Hawking did so, too, in a two-page 2014 paper posted to the preprint site arXiv.org. It wasn’t a technical paper, with zero equations, but rather a summary of a talk he’d given at a conference the prior year. Hawking suggested that perhaps the event horizon is not some definite point of no return beyond which nothing could escape a black hole. Maybe there was just an “apparent horizon” that temporarily confined the information. The information is not stored in the interior of the black hole but in its boundary: the event horizon. Hawking’s final paper builds on that prior insight. As Perry writes, he and a third co-author, Harvard’s Andrew Strominger, found a gap in the mathematical argument concluding that black holes had no hair. In their new paper, they’ve come up with a new way to calculate the entropy of a black hole. They show that you can record the entropy of a black hole in the photons (particles of light) bouncing around the event horizon. Those photons make up a kind of halo around the black hole that the authors have dubbed “soft hair.” And that soft hair can account for the entropy. Hawking died before the paper could be published. But Perry told BBC News that he had called his colleague just before that—unaware of how ill Hawking had become—and told him via loudspeaker of their conclusions. “When I explained it, he simply produced an enormous smile,” Perry said.